Chances are, you’ve heard of (or have painted) a Paint by Number kit. In it, you are supplied with all of the necessary tools to paint a beautiful picture, including a pre-made board that tells you exactly which colors to paint and where. What if you could apply that concept to painting your way to a larger income? 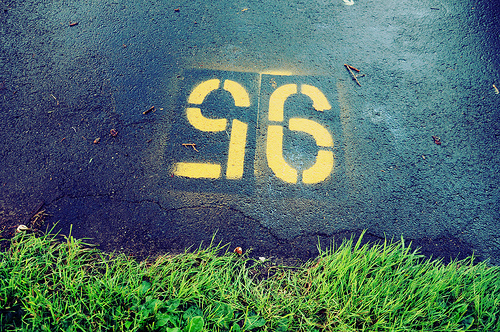 If you’ve ever heard of curbside number painters, you’re already on your way! 1. Appreciate this niche industry. While regulations exist to mandate that house numbers be painted on curbs, there really aren’t any businesses that specialize in completing this service exclusively. This is due to a variety of factors but mostly boils down to the lack of big-number income this can provide for a larger business. Turn their loss into your opportunity; charging a mere $20-25 for your services will surely entice orders when it’s compared to the “big guys’” price tags of $50+. 2. Celebrate the low entry barriers. Virtually anyone can do this if they have the proper tools, which also happen to be very cheap. All you need to do the job are a few stencils (pick up at your local home improvement store for less than $20) and some spray paint (standard colors are white and black but you can provide a value-add if you also offer reflective paint for an additional cost). 3. Spread the word. While you can rely on advertising to boost your opportunity for this work, the best way is to ignite positive word of mouth references. You can begin with your surrounding communities and work your way out if you wish. The beauty of this type of work is that you can choose to grow or not grow your business—and still keep earning money because the numbers need to be re-painted at least annually! 4. Build your business. Once you’ve established yourself, consider reaching out to homeowner associations or builders directly. Don’t underestimate the power of this type of networking as in can yield long-term contracts to guarantee future income. You can also distribute flyers or place ads in newspapers, but makes sure to factor in these costs before moving doing so. 5. Maintain your equipment. Depending on your workload, maintaining your equipment will come at a minimal cost. You’ll of course need to continually purchase new paint, but if you shop well, you can reduce your costs significantly (also consider signing up for a contractor’s discount at your local home supply store). Other than paint, you’ll only need to replace the stencils as they begin to wear out.